After completing a PhD in Neuroscience at MIT at age 26, Rose knew one thing for sure: she didn't want to be a neuroscientist. Oops. After a circuitous path that led through an ecological field station in therain forest of Costa Rica, an island in Nicaragua's Lake Omotepe, and an organic coffee farm in Guatemala, Rose returned to California and studied organic farming at the Center for Agroecology and Sustainable Food Systems at the University of California, Santa Cruz. After completing a 6-month residential apprenticeship in all aspects of organic farming and gardening, Rose earned a Certificate in Ecological Horticulture. Rose then had the opportunity to remain at the Center for an additional year, as the Propagation Manager, responsible for managing the greenhouses and growing all the plant starts for the 20–acre Farm & Garden. 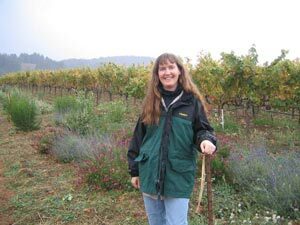 She then spent a year growing organic vegetables and cut flowers at the renowned organic gardens at Fetzer Vineyard's Valley Oaks Ranch. Rose spent the next 6 ½ years managing Ecological Restoration programs at Circuit Rider Productions, a non-profit organization dedicated to the restoration and enhancement of human and ecological systems. Her responsibilities included managing the Native Plants Nursery, the Russian River Giant Reed Removal and Habitat Restoration Program (a $1.3 million-dollar grant-funded effort to remove Giant Reed from the Russian River Watershed), and managing the staff, budgets and contracts of the Ecological Restoration program at CRP. Rose founded Farm Stewards to unite her passion and experience in the areas of sustainable farming and ecological restoration, and to make this experience and passion available to her clients, the land owners and land managers of Northern California, who work each day to steward the land under their care.